This new project is to create the show-home arena at Bideford. We start this project with our set of plans and a blank canvas (in other words a building site). This job entails the creation of the gardens to the rear of both the Stratford and the Oxford show homes, the front gardens, which is an open plan area, this will also be the front of the markting suite and finally the car parking area. We are starting with the 'Oxford' rear garden. 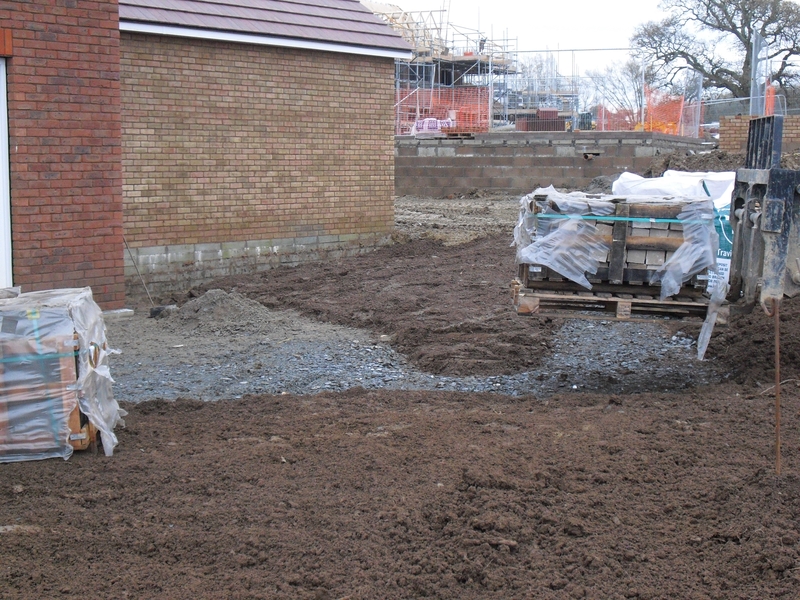 These first pictures show us taking delivery of some of the materials we need to start laying the patio. The ground has been prepared and the patio marked out. We are starting with the laying of the Indian sandstone patio. This will be edged with sandstone cobble setts, these will also be used to edge the gravel path which will lead to a circular seating area. This will become clearer as we progress with this garden and post more pictures. The shaping for the patio is carefully marked out, checking the shape and measurements carefully against the plans. A discussion is held, we just want to double check everything before any cutting takes place, after which ther is no turning back! With the shaping of the patio done and the other areas marked out or defined with the cobbles, we can now get some of the plants in. This is now beginning to look more like a garden.